Available at your nearest TBS COMICS Friday, November 13th. Commander is an exciting, unique way to play Magic that is all about awesome legendary creatures, big plays, and battling your friends in epic multiplayer games! In Commander, each player chooses a legendary creature as the commander of their deck. They then play with a 99-card deck that contains only cards of their commander’s colors. Also, other than basic lands, each deck also may only use one copy of any card. 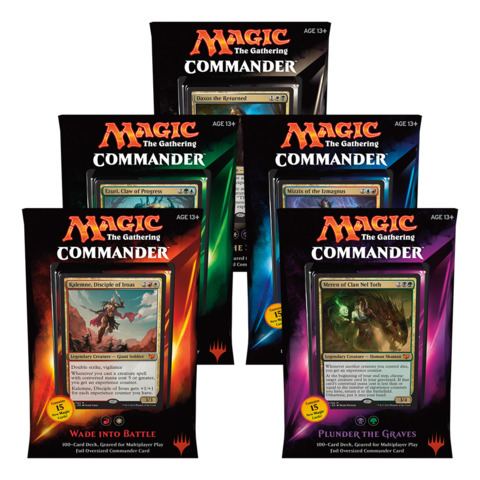 During the game, you can cast your commander multiple times, meaning your favorite Legendary Creature can come back again and again to lead the charge as you battle for victory! TBS COMICS: the comic book shop with all the cool things you need! !